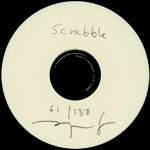 This limited edition CD "Scrabble" was sent out to all of the people who sent Magne a "Mags doll" for his exhibition. The CD-R is white with "Scrabble" hand written at the top plus limited edition number (out of 130 copies made) and Magne signature at the bottom. Each disc comes with a printed letter from Magne with the addressee name hand written at the top and Magne's signature at the bottom. The disc contains nearly 14 minutes (13:44) of talking by Magne, the different voices of Magne have been overlaid over one another, so that it sounds like the voices of the Mags dolls all talking at once!